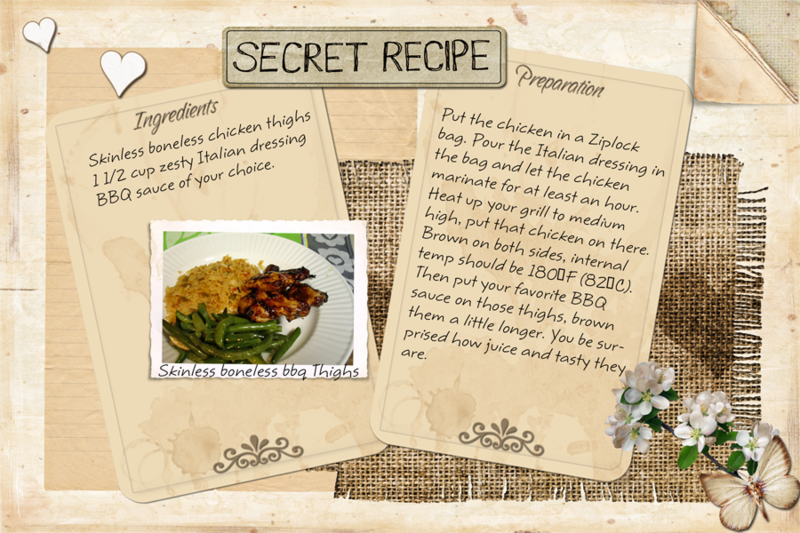 Home » Posts Tagged "Poultry"
I got this original recipe of Todd’s Secret Recipe. It suppose to be a clone for KFC baked chicken, and I got to say it truly is a tasty dish. 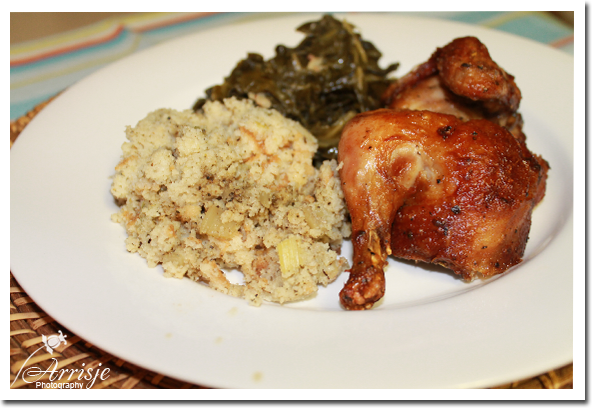 The only change I made was to leave the msg out,added brown sugar to the brine, and used my rotisserie machine. Dissolve the salt and brown sugar in the water to make the marinade (brine). Add the chicken, cover and chill for exactly 2 hours. Whisk together the oil, liquid smoke, and soy sauce in a small bowl. Combine all of the ingredients for the seasoning in a small bowl. When the chicken has marinated, rinse each piece of chicken with water and blot dry. Brush oil over one side of each piece of chicken. Sprinkle the seasoning over the oiled side of each piece of chicken, then flip each piece, brush with oil again and sprinkle on more seasoning. If you own a rotisserie use it like I did. Put the rotisserie on for 1 hr and 10 min. If you don’t own one you can still make it in your oven. Just a bit more work for you. Preheat your oven to 350 degrees F, or 325 degrees F if you have a convection oven. Brush some of the leftover oil solution onto an oven-safe grill pan or grill plate. 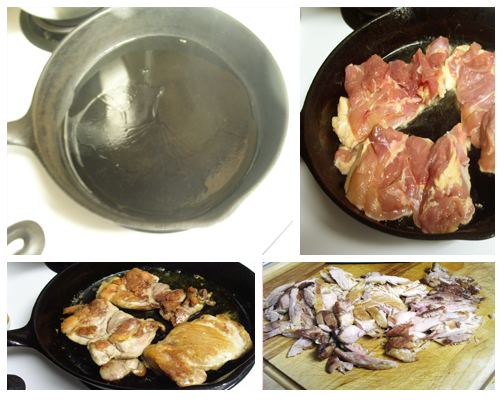 Set the pan over medium heat, and when the oil begins to smoke, place the chicken skin-side-down on the pan. Cook the chicken for 2 to 3 minutes or until the skin begins to brown and grill marks form on the chicken, then flip the chicken and cook it for another 1 to 2 minutes. Pop the grill pan into the oven for 20 minutes, then flip each piece of chicken and bake for another 20 minutes, or until the surface of the chicken is golden brown, and the chicken is cooked through. If you own a rotisserie use it like I did. Put the rotisserie on for 1 hr and 10 min. If you don't own one you can still make it in your oven. Just a bit more work for you. 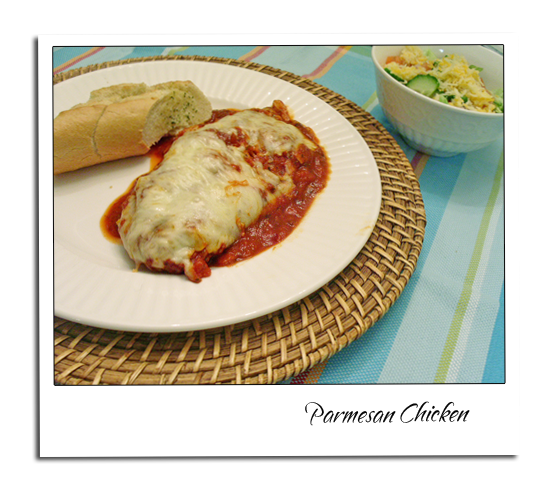 Chicken Parmesan, chicken parmigiana, or (Italian Pollo alla parmigiana) is a popular Italian dish. 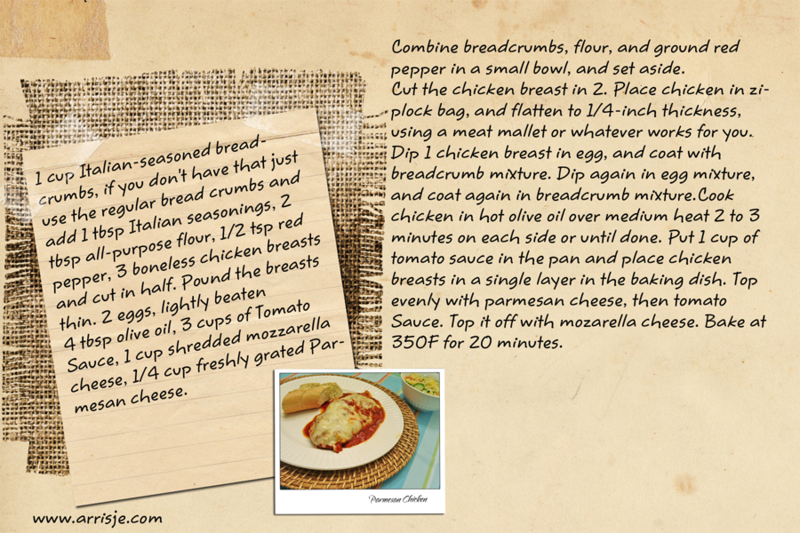 It is made up of a chicken breast covered in bread crumbs and topped with tomato sauce and mozzarella. The chicken may be baked or fried. It is always served over spaghetti. Some variations of the traditional recipe may call for the use of Parmigiano-Reggiano (parmesan cheese) in addition to, or as a substitute for, mozzarella. This may reflect a confused belief that the dish is so-named because it contains Parmesan cheese; in fact both the dish and the cheese are (separately) named for the Parma region of Italy. The “Parma” in Australia is a very popular pub meal often served with a beer. for normally $10 AUD you can buy a “pot n’ Parma” for lunch. In some Australian states groups of Chicken Parmigiana eaters have started clubs such as CPAS (Chicken Parma Appreciation Society). These groups are mostly male dominated. I made this dish with Alfredo Sauce and Marinara Sauce. Which ever one you prefer they are both delicious. 3 boneless chicken breasts and cut in half. 3 cups of Tomato Sauce like marinara sauce or get the tomatoes out of a can. 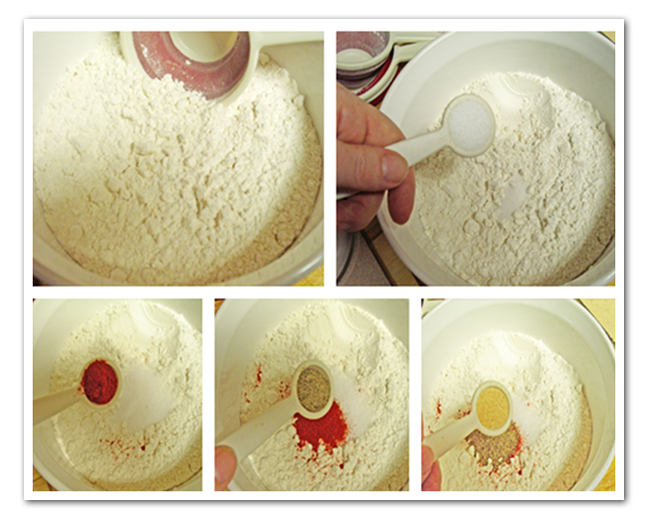 Combine breadcrumbs, flour, and ground red pepper in a small bowl, and set aside. Cut the chicken breast in 2. 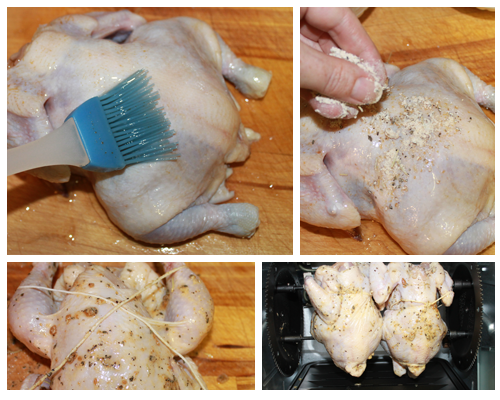 Place chicken in ziplock bag, and flatten to 1/4-inch thickness, using a meat mallet or whatever works for you. Dip 1 chicken breast in egg, and coat with breadcrumb mixture. Dip again in egg mixture, and coat again in breadcrumb mixture. Cook chicken in hot olive oil over medium heat 2 to 3 minutes on each side or until done. 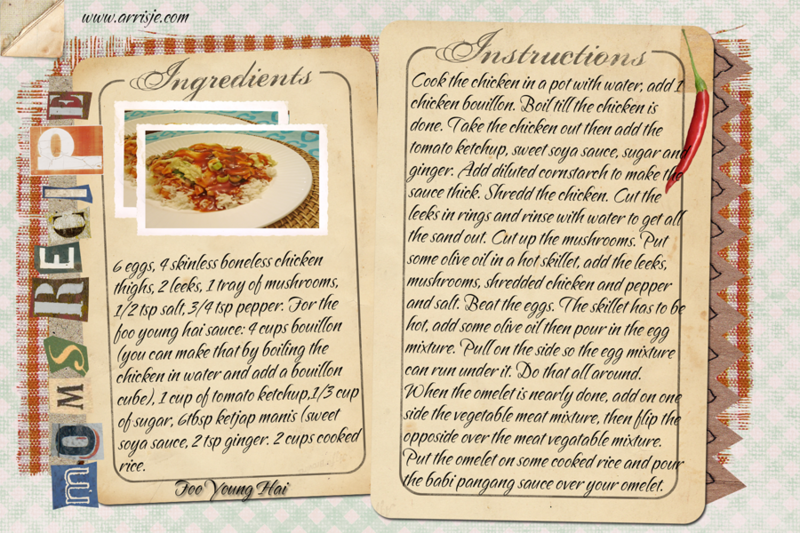 Put 1 cup of tomato sauce in the pan and place chicken breasts in a single layer in the baking dish. Top evenly with parmesan cheese, then tomato Sauce. Top it off with mozarella cheese. Bake at 350F for 20 minutes or until cheeses melt. Cut the chicken breast in 2. 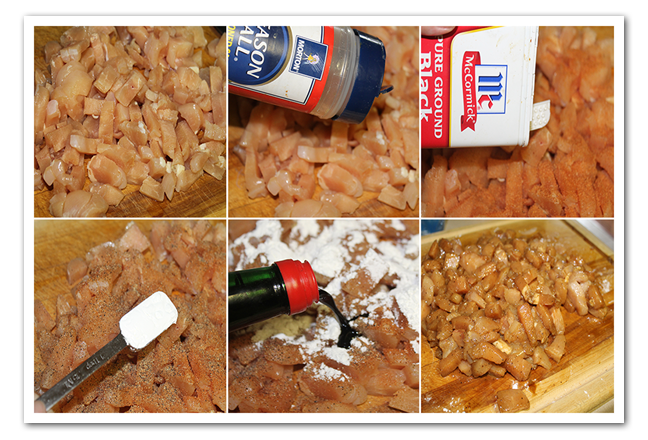 Place chicken in ziplock bag, and flatten to ¼-inch thickness, using a meat mallet or whatever works for you. Chicken, you can fix them so many ways. Lately I like my chicken skinless. And the good part is that it’s healthier, so I am told :), and this one doesn’t take you know time to grill, and you only need 3 ingredients. Put the chicken in a Ziplock bag. 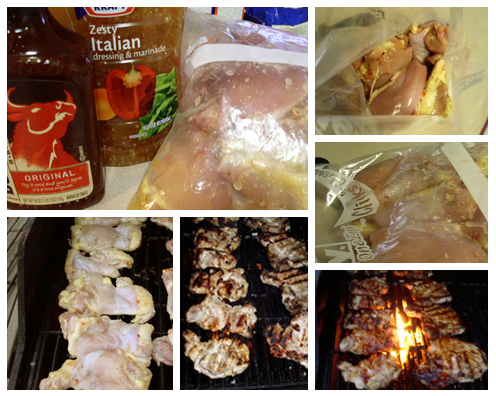 Pour the Italian dressing in the bag and let the chicken marinate for at least an hour. Heat up your grill to medium high, put that chicken on there. Brown on both sides, internal temp should be 180°F (82°C). Then put your favorite BBQ sauce on those thighs, brown them a little longer. You be surprised how juice and tasty they are. I could not find a lot about the history of Foo Yong Hai, but I believe it must have had traveled through a long and winding path to become the way it is now. But Nevertheless during its spread in Western Europe Foo Young Hai has gradually changed and was adapted as a more western style omelet with fillings inside, while in Canton, the standard way of cooking fried Foo Yong eggs is actually mix the ingredients (Cantonese BBQ pork strips and other vegetables) with the beaten egg yolk before frying. Apart from that, I found out that “hai” means crab. The Foo Yong Hai that I know mostly uses prawns, shrimps or chicken. Either way it’s a delicious dish. 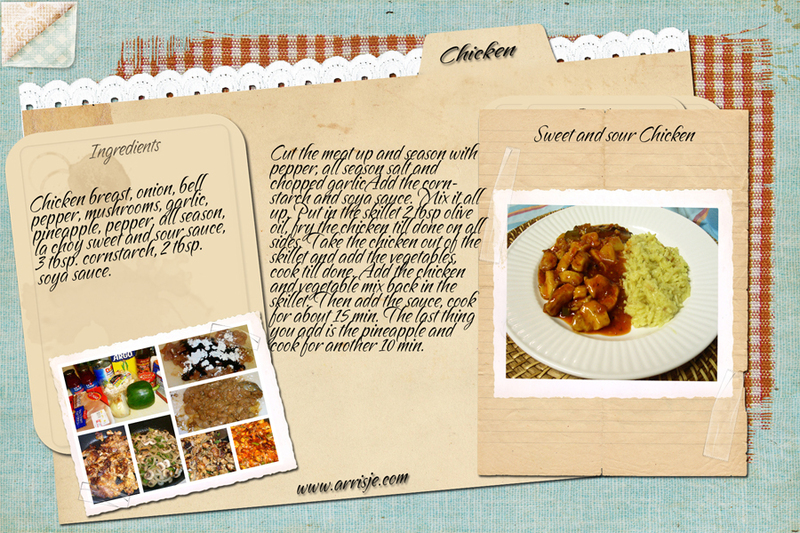 In this recipe I used chicken. 1. First start making the Foo Young Hai Sauce. 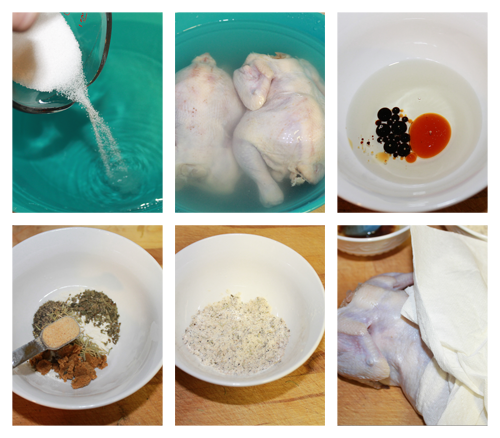 Cook the chicken in a pot with water, add 1 chicken bouillon cube. Boil till the chicken is done. Take the chicken out then add the tomato ketchup, sweet soya sauce, sugar and ginger to the 4 cups of broth. Add diluted cornstarch to make the sauce thick. 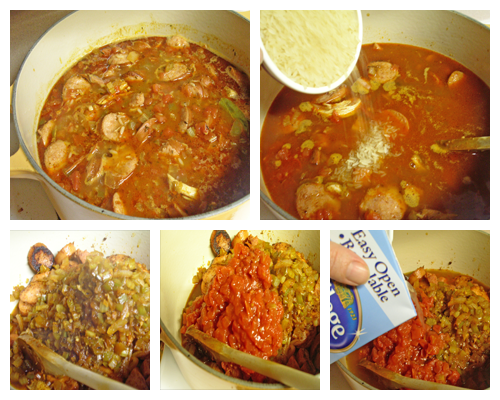 You can freeze the sauce before you add the diluted cornstarch. 2. Shredd the chicken. Cut the leeks in rings and rinse with water to get all the sand out. Cut up the mushrooms. 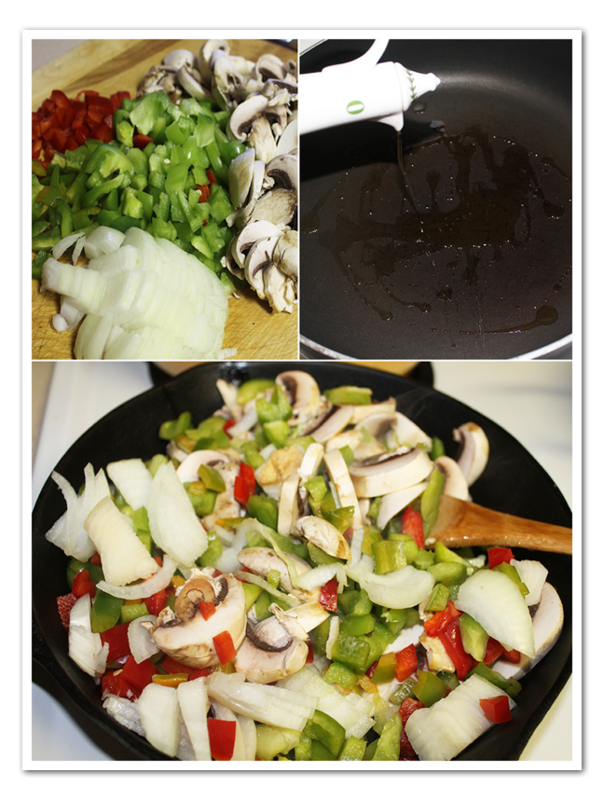 Put some olive oil in a hot skillet, add the leeks, mushrooms, shredded chicken and pepper and salt. 3. Now it’s time to make the omelet. Beat the eggs. The skillet has to be hot, add some olive oil then pour in the egg mixture. Pull on the side so the egg mixture can run under it. Do that all around. When the omelet is nearly done, add on one side the vegetable meat mixture, then flip the opposide over the meat vegatable mixture. Put the omelet on some cooked rice and pour the babi pangang sauce over your omelet. First start making the Foo Young Hai Sauce. Cook the chicken in a pot with water, add 1 chicken bouillon cube. Boil till the chicken is done. 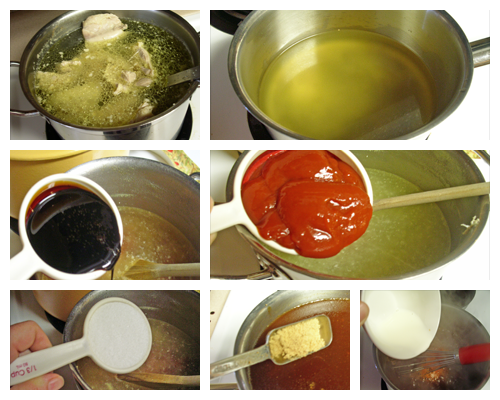 Take the chicken out then add the tomato ketchup, sweet soya sauce, sugar and ginger to the 4 cups of broth. Add diluted cornstarch to make the sauce thick. 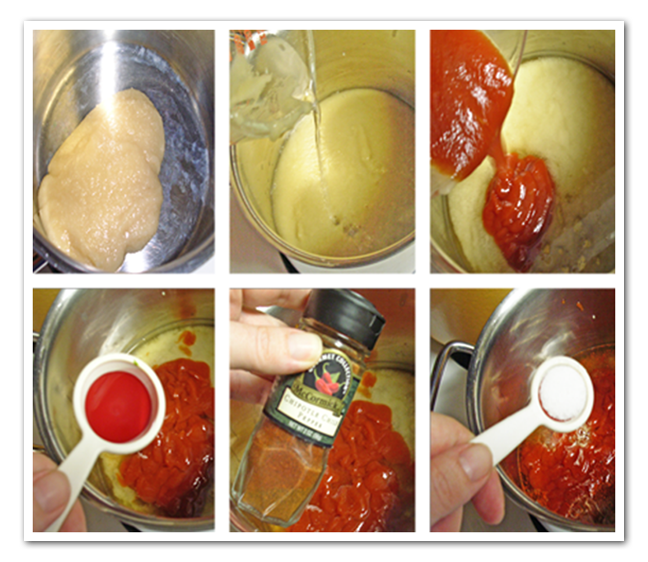 You can freeze the sauce before you add the diluted cornstarch. Shred the chicken. Cut the leeks in rings and rinse with water to get all the sand out. Cut up the mushrooms. 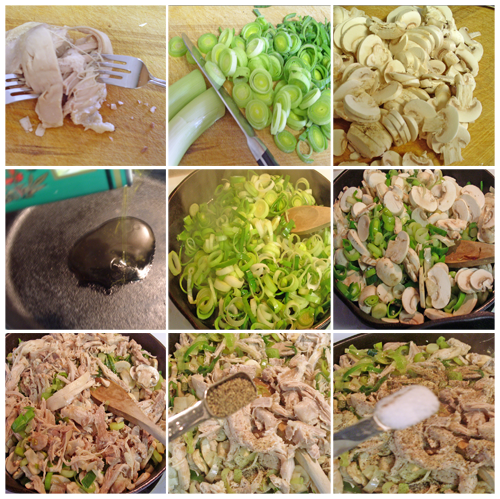 Put some olive oil in a hot skillet, add the leeks, mushrooms, shredded chicken and pepper and salt. Now it's time to make the omelet. Beat the eggs. The skillet has to be hot, add some olive oil then pour in the egg mixture. Pull on the side so the egg mixture can run under it. Do that all around. When the omelet is nearly done, add on one side the vegetable meat mixture, then flip the opposite over the meat vegetable mixture. 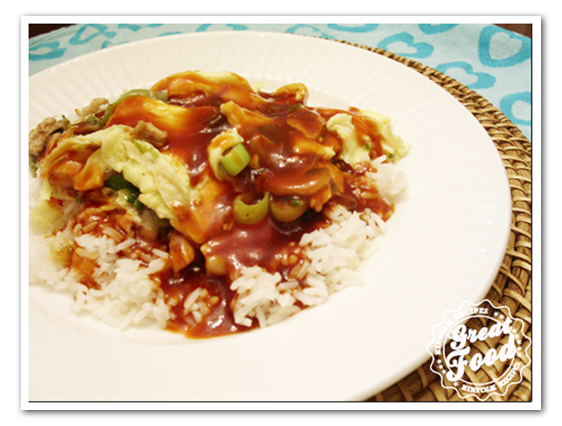 Put the omelet on some cooked rice and pour the Foo Young Hai sauce over your omelet. Put the chicken breast in a pot, add enough water to cover the chicken. Add the chicken base and simmer (about 1.2 hour) or until the chicken is done. Cut the onion up, add 1 tbsp olive oil to the skillet and add the onion and garlic, brown lightly. Take the chicken out of the broth, and strain the broth. Shred the chicken and put it back in the broth. Add the beans, tomatoes, chiles, onion, garlic and seasonings. Simmer for about an 1/2 hour. 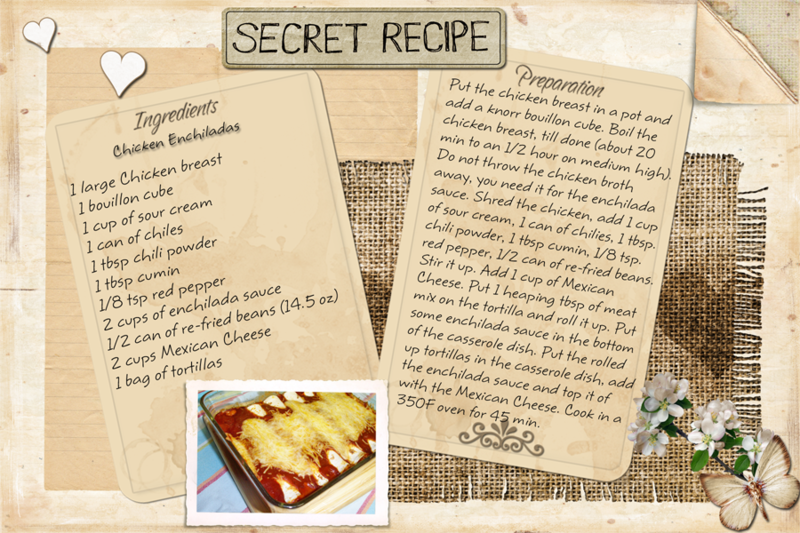 Serve with some Monterrey Jack Cheese and green onions. If you like it thick simmer till the stock is more reduced. Take the chicken out of the broth, and strain the broth. Shred the chicken and put it back in the broth. Add the beans, tomatoes, chiles, onion, garlic and seasonings. Simmer for about an ½ hour. 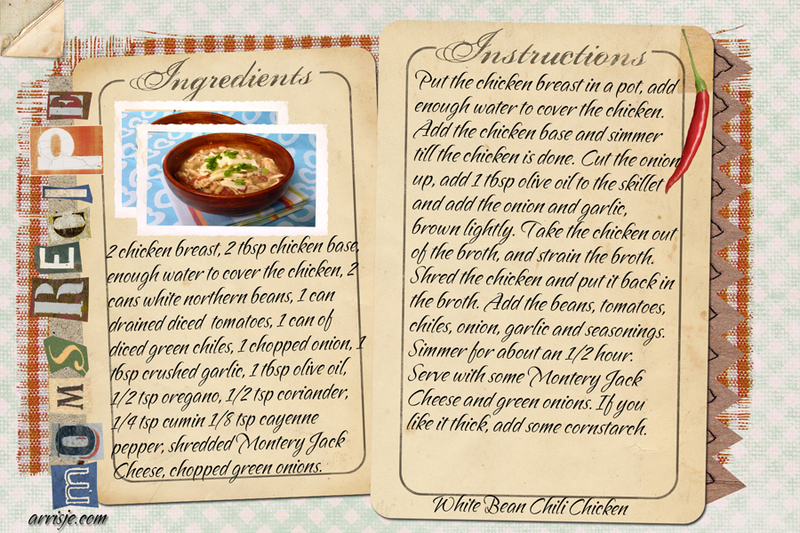 Serve with some Monterrey Jack Cheese and green onions. If you like it thick simmer till the stock is more reduced. 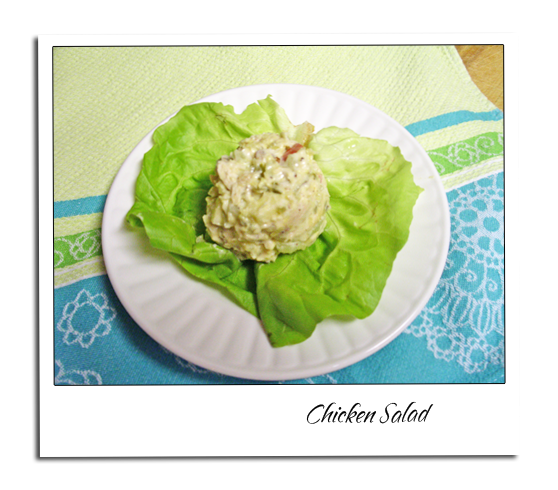 Chicken salad can really be just about any kind of salad that includes chicken as the primary ingredient. Some very commonly added ingredients can include: Celery, eggs, mayonnaise and different kinds of mustards. The history of the first chicken salad has been traced back to 1863. In the town of Wakefield, Rhode Island, a man named Liam Gray combined leftover chicken with mayonnaise, tarragon, and grapes and sold it as a salad at his meat market, Town Meats. Today, the meat market is now a delicatessen and still serves the original chicken salad. 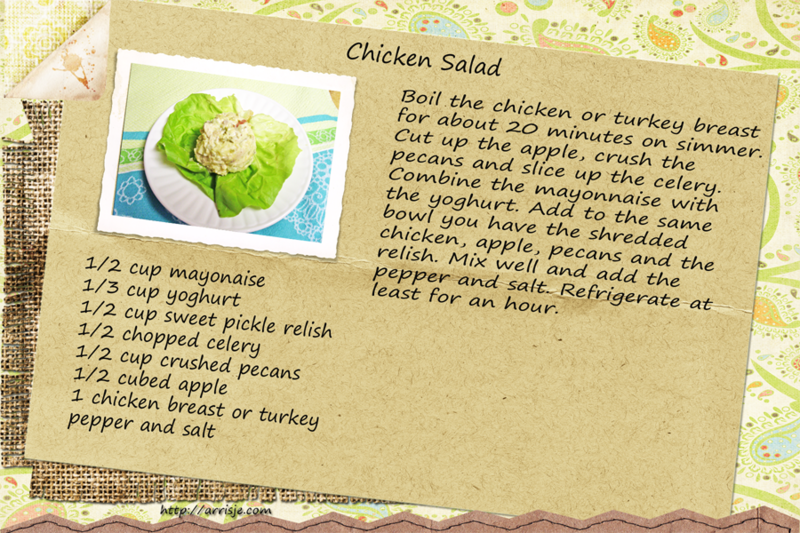 In the United States, chicken salad often is comprised of chopped white chicken meat, and salad dressing or mayonnaise. It’s often served as either a salad, or as a sandwich on wheat bread, accompanied by avocados, iceberg lettuce and tomatoes. 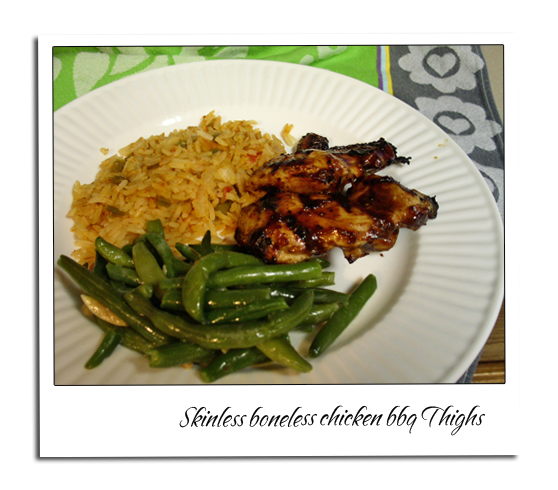 It’s usually made to use tougher chicken, canned chicken or any leftovers so that they don’t go to waste. Throughout Asia and most of Europe, chicken salad can be topped by a wide variety of different dressings for flavoring. It can also be accompanied by various vegetables, fresh leaves, pastas, noodles and rice. Boil the chicken or turkey breast for about 20 minutes on simmer. Cut up the apple, crush the pecans and slice up the celery. Combine the mayonnaise with the yoghurt. 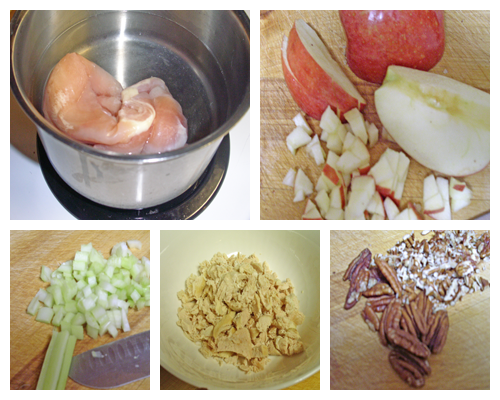 Add to the same bowl you have the shredded chicken, apple, pecans and the relish. Mix well and add the pepper and salt. Refrigerate at least for an hour. The word pizza is believed to be from an Old Italian word meaning “a point,” which in turn became the Italian word “pizzicare,” which means “to pinch” or “pluck.” Pizza has been a basic part of the Italian diet for a long time. Most people associate pizza with Italie. It is also said that the idea of using bread as a plate cam from the Greeks. Umberto I (1844-1900), King of Italy, and his wife, Queen Margherita di Savoia (1851-1926), in Naples on holiday, called to their palace the most popular of the pizzaioli (pizza chef), Raffaele Esposito, to taste his specialties. He prepared three kinds of pizzas: one with pork fat, cheese, and basil; one with garlic, oil, and tomatoes; and another with mozzarella, basil, and tomatoes (in the colors of the Italian flag). The Queen liked the last kind of pizza so much that she sent to the pizzzaiolo a letter to thank him saying, “I assure you that the three kinds of pizza you have prepared were very delicious.” Raffaele Esposito dedicated his specialty to the Queen and called it “Pizza Margherita.” This pizza set the standard by which today’s pizza evolved as well as firmly established Naples as the pizza capitol of the world. In the late 19th century, pizza was sold in the streets in Naples at breakfast, lunch, and dinner. It was cut from a large tray that had been cooked in the baker’s oven and had a simple topping of mushrooms and anchovies. 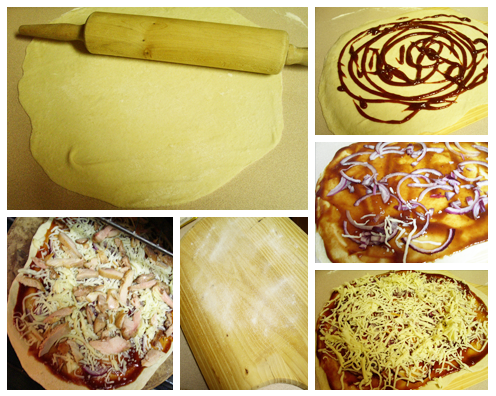 As pizza became more popular, stalls were set up where the dough was shaped as customers ordered. Various toppings were invented. The stalls soon developed into the pizzeria, an open-air place for people to congregate, eat, drink, and talk. Pizza migrated to America with the Italians in the latter half of the 19th century. Pizza was introduced to Chicago by a peddler who walked up and down Taylor Street with a metal washtub of pizzas on his head, crying his wares at two cents a chew. This was the traditional way pizza used to be sold in Naples, in copper cylindrical drums with false bottoms that were packed with charcoal from the oven to keep the pizzas hot. The name of the pizzeria was embossed on the drum. For many people, especially among the Italian-American population, the first American pizzas were known as Tomato Pie. Even in the present 21st century, present-day tomato pie is most commonly found in the Northeastern United States, especially in Italian bakeries in central New York. Tomato pies are built the opposite of pizza pies – first the cheese, then the toppings, and then the sauce. 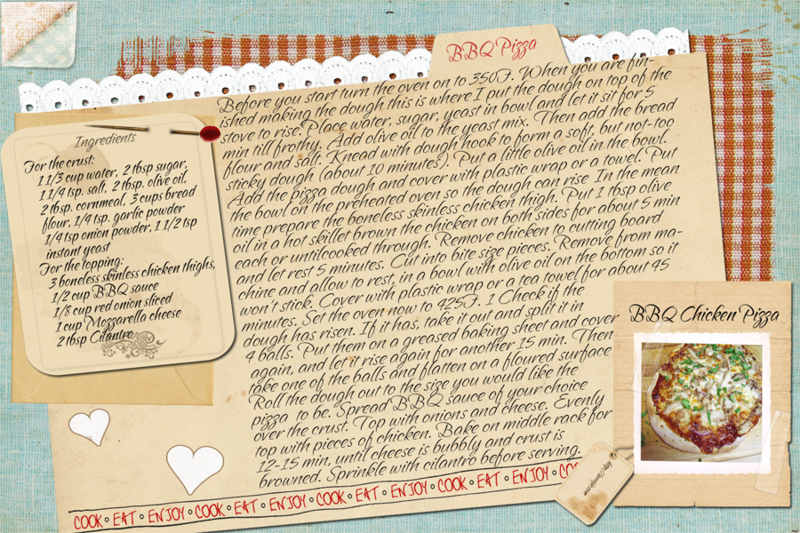 In case you would like to read more about the history of Pizza I Found this story on whats cooking America. Before you start turn the oven on to 350F. When you are finished making the dough this is where I put the dough on top of the stove to rise. 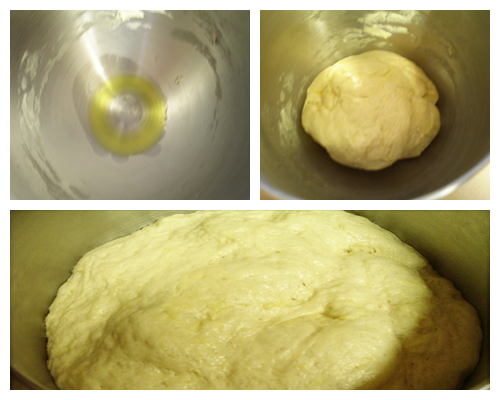 Place water, sugar, yeast in bowl and let it sit for 5 min till frothy. 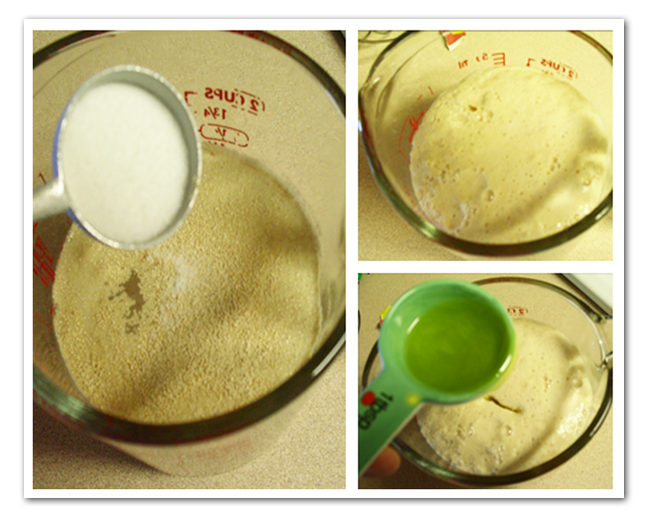 Add olive oil to the yeast mix. Then add the bread flour and salt. Knead with dough hook to form a soft, but not-too sticky dough (about 10 minutes). 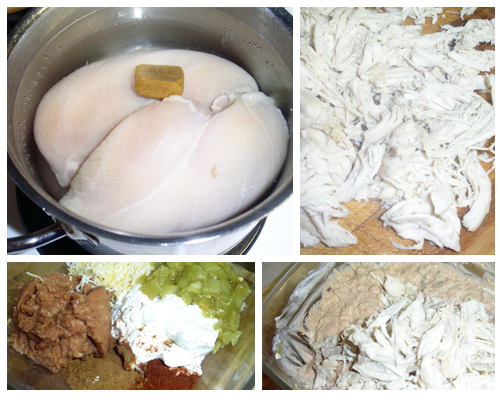 In the mean time prepare the boneless skinless chicken thigh. Put 1 tbsp olive oil in a hot skillet brown the chicken on both sides for about 5 min each or until cooked through. Remove chicken to cutting board and let rest 5 minutes. Cut into bite size pieces. 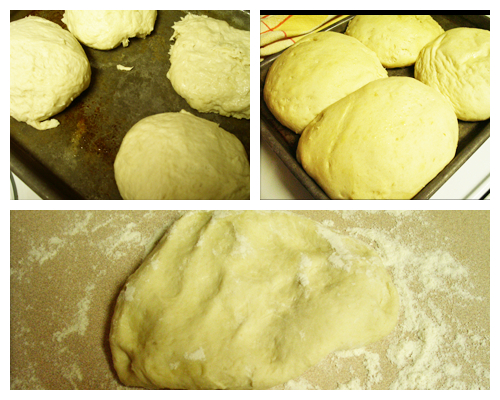 Roll the dough out to the size you would like the pizza to be. 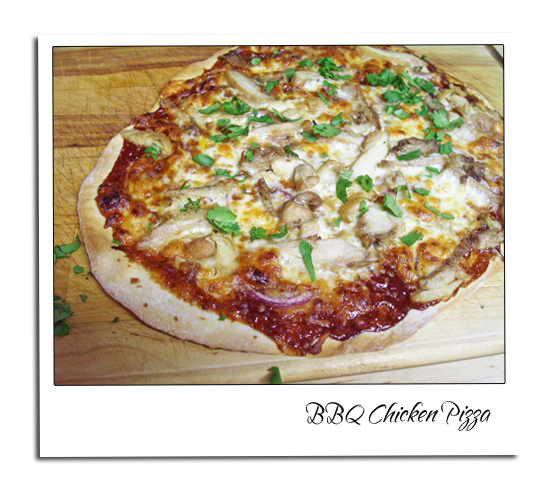 Spread BBQ sauce of your choice over the crust. Top with onions and cheese. Evenly top with pieces of chicken. Bake on middle rack for 12-15 min, until cheese is bubbly and crust is browned. Sprinkle with cilantro before serving. In another skillet cook the vegetables, till done. Put in the skillet 2 tbsp olive oil, fry the chicken till done on all sides. Add the cooked vegetables to the skillet with the fried chicken. Then add the sweet and sour sauce, cook for about 15 min. The last thing you add is the pineapple and cook for another 10 min. 2 cans of pinto beans. 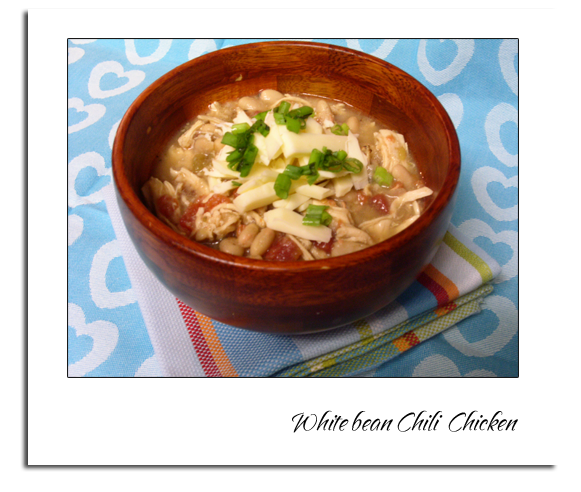 If you don’t have that you can use the white beans in tomato sauce or black beans. Cut up the chicken breast. Season and brown the meat, when the meat is brown add the onion. Add the bell pepper and garlic. When the onion is done add the tomatoes and mushrooms. Add a cup of chicken broth or water, 1 bouillon cube, and the bay leaves. Add the rinsed beans, 1 tbsp of vinegar 1 tbsp of sugar and 2 tbsp ketjap manis (sweet soya sauce), simmer for 20 min. 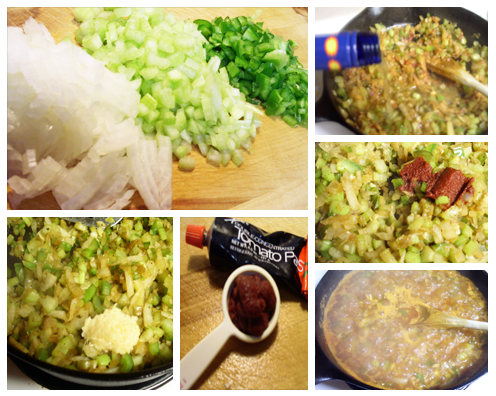 When you simmer the beans you should also cook the rice and make the pickled cucumber. To make the pickled cucumber you slice the cucumber thin add 1 teaspoon of salt, let it sit for about 15 minutes. Squeeze the juice out of it. 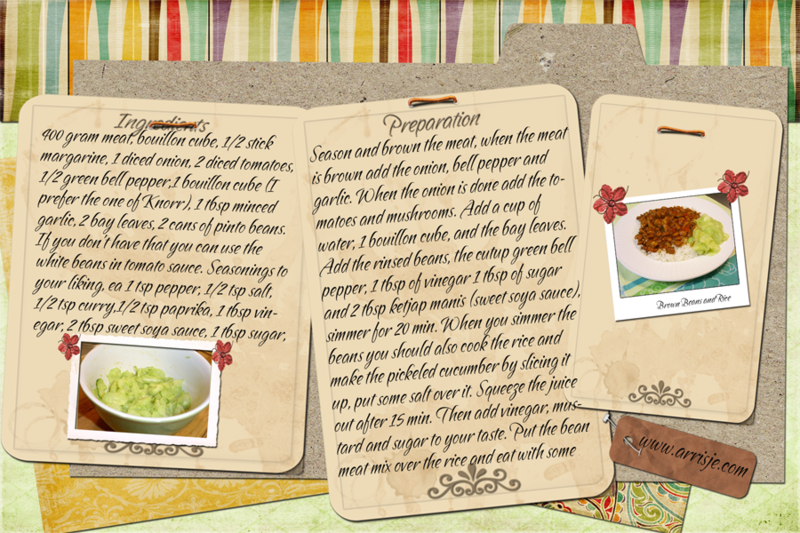 Then add 1 Tablespoon of sugar, 1 teaspoon mustard and 1 tablespoon of vinegar and pepper to taste. 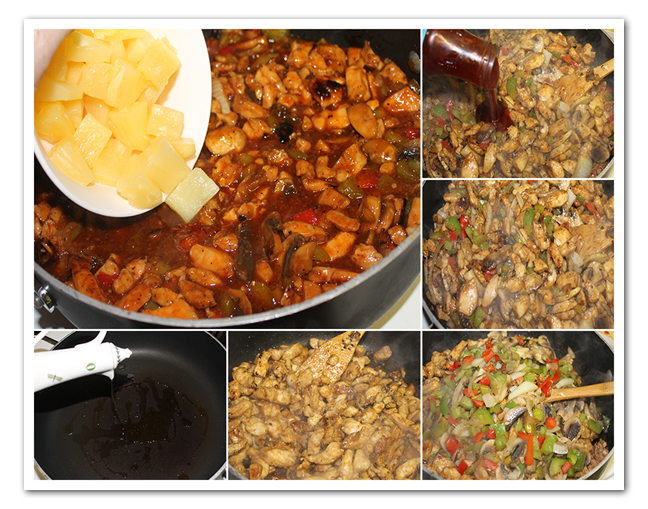 Put the bean meat mix over the cooked rice and eat with some pickled cucumber. 2 cans of pinto beans. 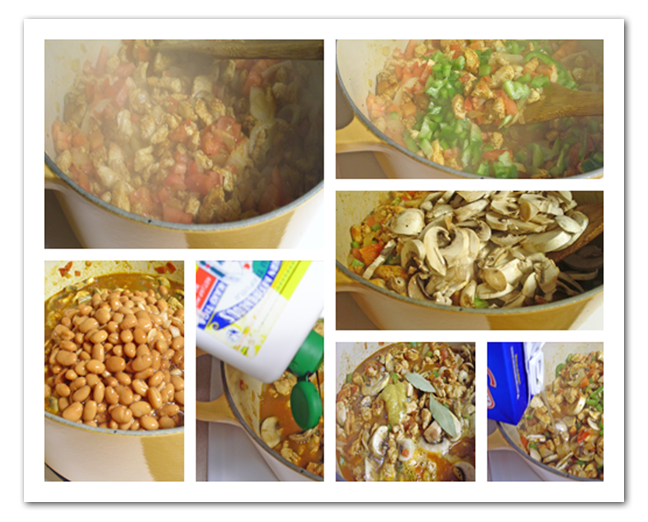 If you don't have that you can use the white beans in tomato sauce. Add the bell pepper and garlic. When the onion is done add the tomatoes and mushrooms. Add a cup of chicken bouillon.1 bouillon cube, and the bay leaves. Add the rinsed beans, 1 tbsp of vinegar 1 tbsp of sugar and 2 tbsp ketjap manis (sweet soya sauce), simmer for 20 min. 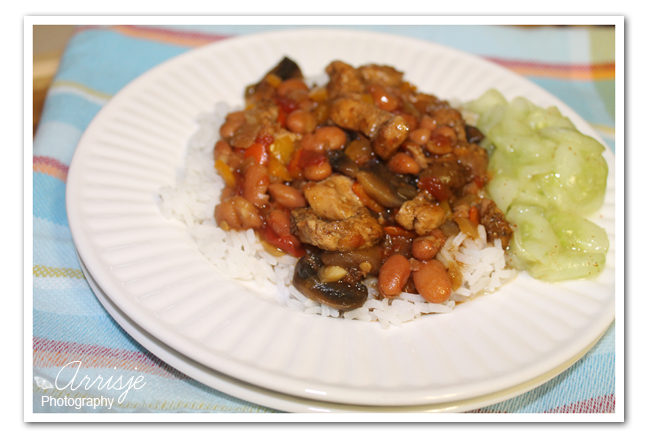 When you simmer the beans you should also cook the rice and make the pickeled cucumber. 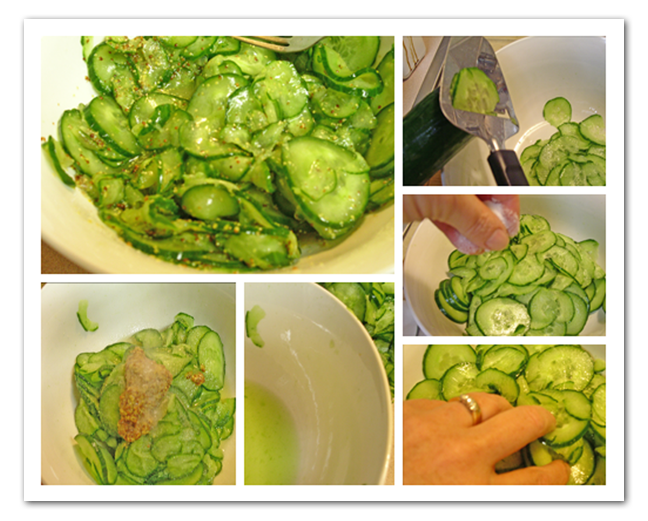 To make the pickled cucumber you slice the cucumber thin add 1 teaspoon of salt, let it sit for about 15 minutes. Squeeze the juice out of it. Then add 1 Tablespoon of sugar, 1 teaspoon mustard and 1 tablespoon of vinegar and pepper to taste.Put the bean meat mix over the cooked rice and eat with some pickled cucumber. 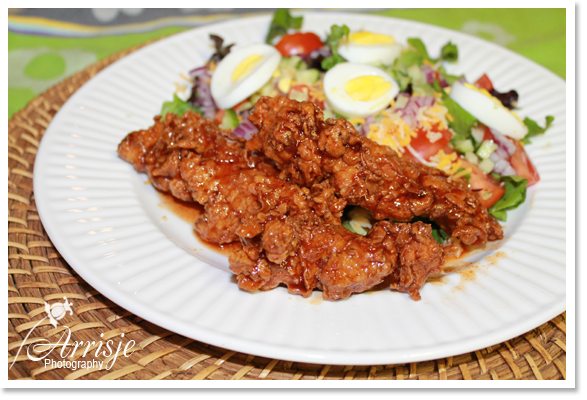 Chili’s Honey Chipotle Chicken Crispers. 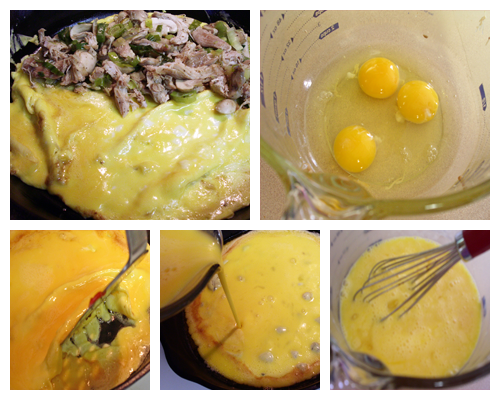 Is the most popular copycat recipe on my site. 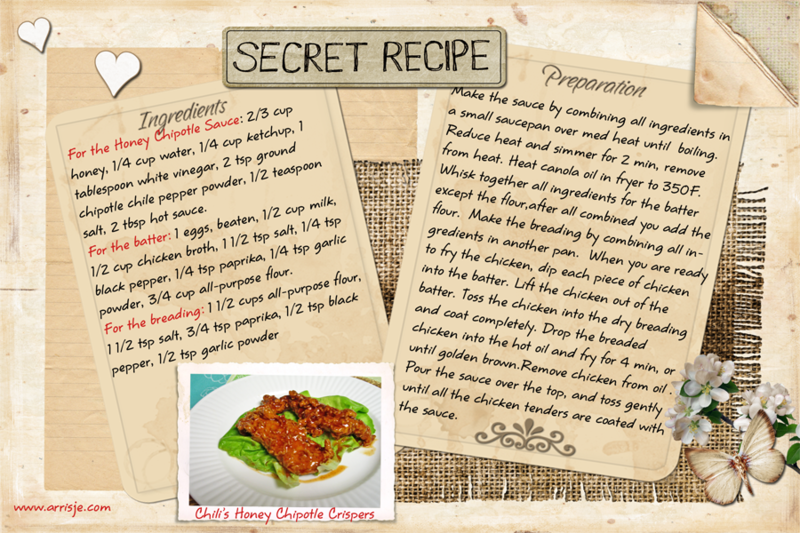 Make honey-chipotle sauce by combining all ingredients in a small saucepan over medium heat until boiling.Reduce heat and simmer for 2 minutes, then remove from heat. Heat the canola oil in the fryer to 350F. 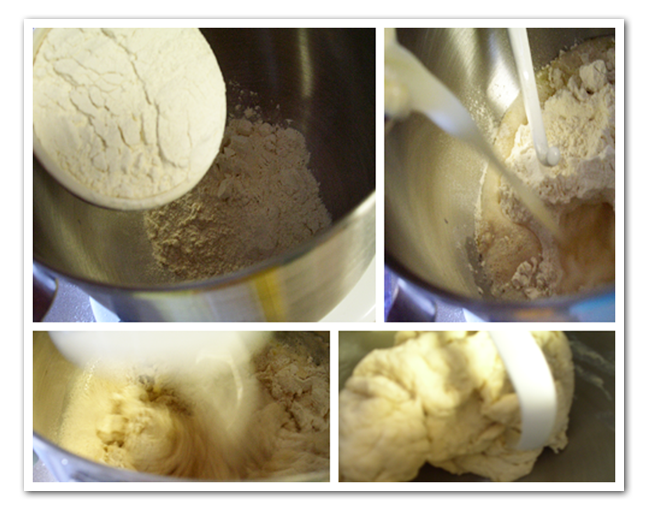 Whisk together all ingredients except the flour, after all combined then you add the flour. Make the breading by combining all ingredients in another pan. 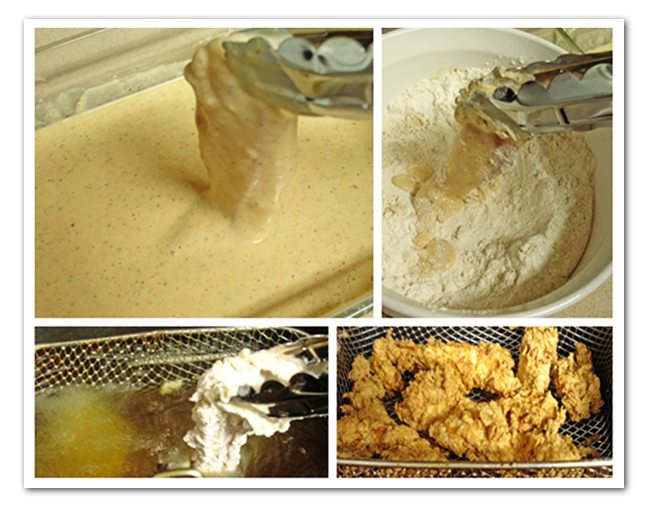 When you are ready to fry the chicken, dip each piece of chicken into the batter. Lift the chicken out of the batter and let some of the excess drip off. Toss the chicken into the dry breading and coat completely. Drop the breaded chicken into the hot oil and fry for 4 minutes, or until golden brown.Remove chicken from oil and allow to drain on paper towels. When all the chicken tenders are done, drop them into a large glass or metal bowl. Pour the sauce over the top, and toss gently until all the chicken tenders are coated with the sauce. Heat the canola oil in the fryer to 350F. 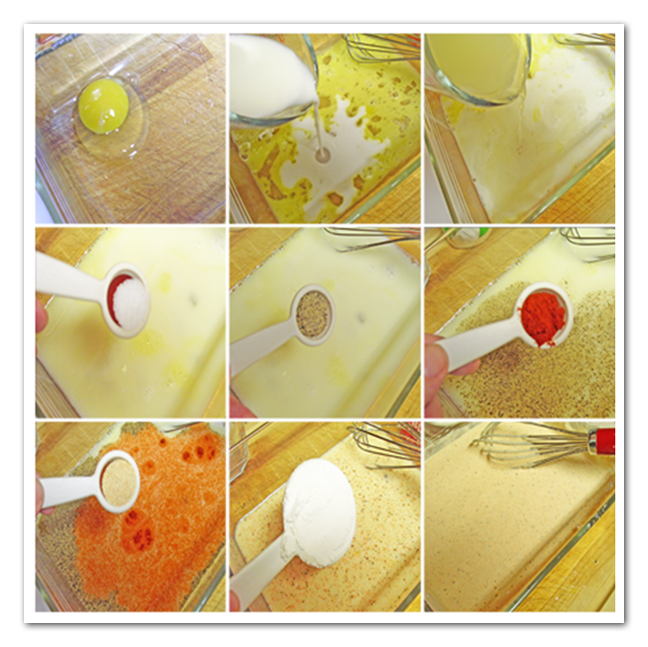 Whisk together all ingredients except the flour, after all combined then you add the flour. Make the breading by combining all ingredients in another pan. Jambalaya is pronounced jahm-buh-LIE-uh or jum-buh-LIE-uh According to the Online Etymology dictionary 1872, from Louisiana Fr., from Prov. jambalaia “stew of rice and fowl.” Jambalaya originated in southern Louisiana by the Cajuns around the bayou where food was scarce, as opposed to the richer part of Louisiana. The word is said to be a compound word of Jambon from the French meaning ham, and Aya meaning rice in African, as there were many slaves in the Louisiana at the time. Common belief is that it originated from the Spanish Paella, which has also transformed in the United States to a dish called Spanish Rice. 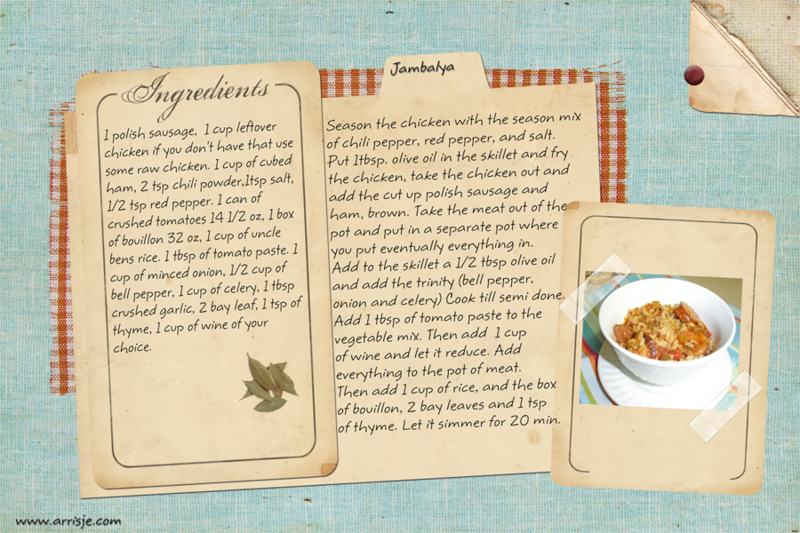 Jambalaya is a bit different many times as it incorporates seafood , ham, link sausage rounds and chicken, although it doesn’t have to have all those ingredients. 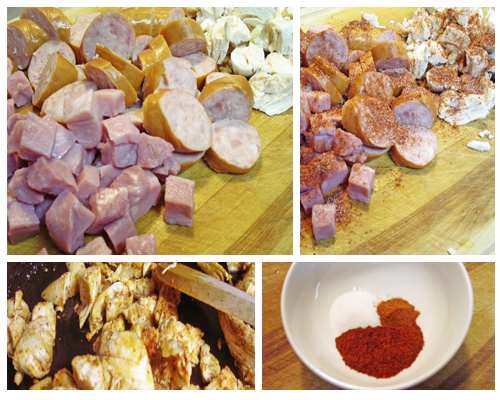 It can be made (separately or all together) with ham, chicken, sausage, fresh pork, shrimp and oysters, to which is added shortening, rice, onion, garlic, pepper and other seasonings. Season the chicken with the season mix of chili pepper, red pepper, and salt. Cut up the vegetables. Put 1tbsp. 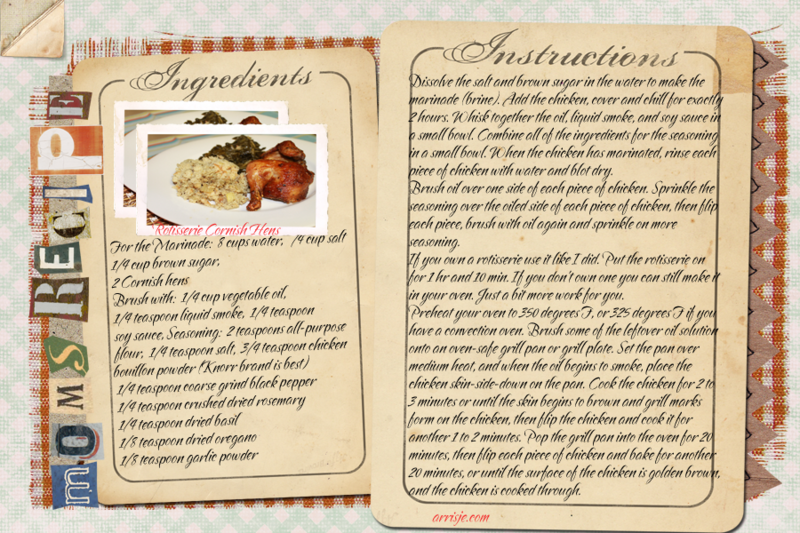 olive oil in the skillet and fry the chicken, take the chicken out and add the cut up polish sausage and ham, and brown. Take the meat out of the pot and put in a separate pot where you put eventually everything in. Add to the skillet a 1 /2 tbsp olive oil and add the trinity (bell pepper, onion and celery) Cook till semi done, add 1 tbsp of tomato paste. Then add the 1 cup of wine and let it reduce. Add all to the pot of meat. Then add 1 cup of rice, the box of bouillon, 2bay leaves and 1 tsp of thyme, let it simmer for 20 min. Jambalaya is pronounced jahm-buh-LIE-uh or jum-buh-LIE-uh According to the Online Etymology dictionary 1872, from Louisiana Fr., from Prov. jambalaia "stew of rice and fowl." Jambalaya originated in southern Louisiana by the Cajuns around the bayou where food was scarce, as opposed to the richer part of Louisiana. The word is said to be a compound word of Jambon from the French meaning ham, and Aya meaning rice in African, as there were many slaves in the Louisiana at the time. Common belief is that it originated from the Spanish Paella, which has also transformed in the United States to a dish called Spanish Rice. 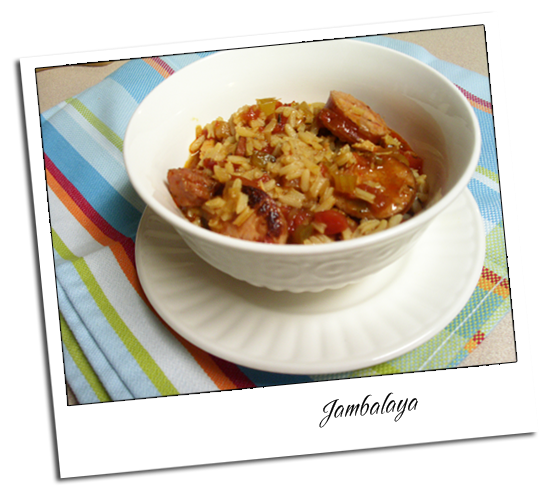 Jambalaya is a bit different many times as it incorporates seafood , ham, link sausage rounds and chicken, although it doesn't have to have all those ingredients. It can be made (separately or all together) with ham, chicken, sausage, fresh pork, shrimp and oysters, to which is added shortening, rice, onion, garlic, pepper and other seasonings. 1 cup of Greek yoghurt in stead of sour cream. 1. 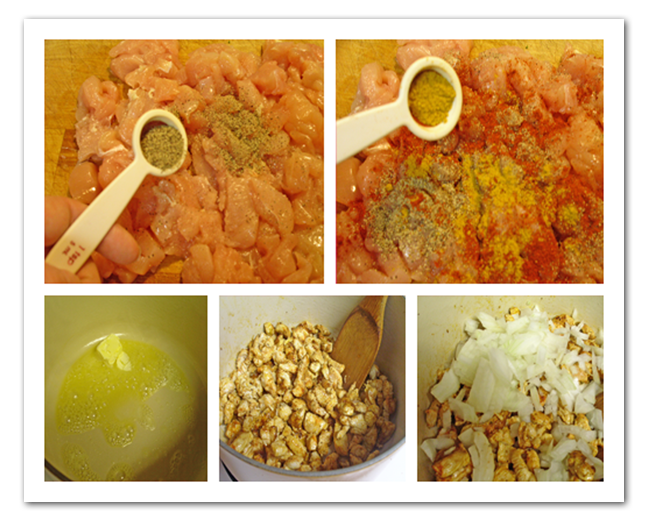 Put the chicken breast in a pot and add a knorr bouillon cube. Boil the chicken breast, till done (about 20 min to an 1/2 hour on medium high). 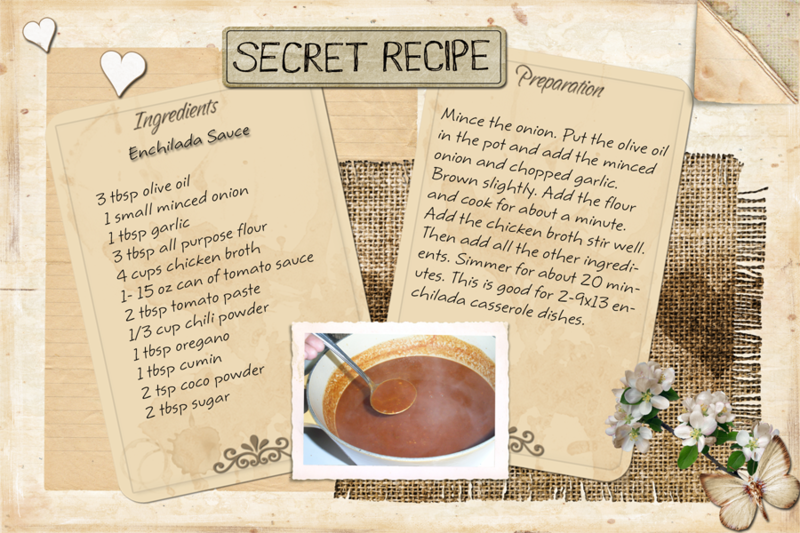 Do not throw the chicken broth away, you need it for the enchilada sauce. Shred the chicken, add 1 cup of sour cream, 1 can of chilies, 1 tbsp. chili powder, 1 tbsp cumin, 1/8 tsp. red pepper, 1/2 can of re-fried beans. Stir it up. Add 1 cup of Mexican Cheese. 2.Put 1 heaping tbsp of meat mix on the tortilla and roll it up. Put some enchilada sauce in the bottom of the casserole dish. 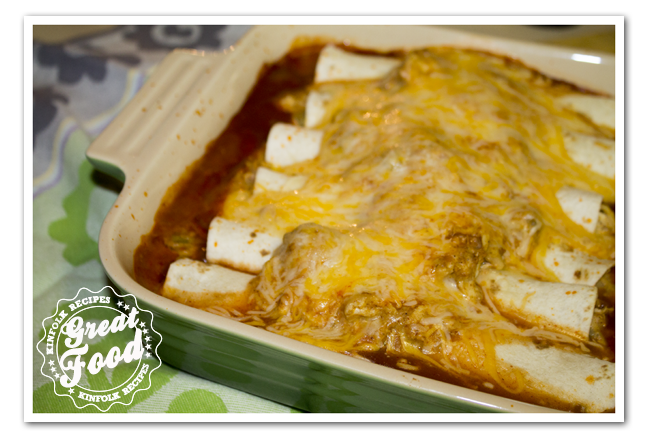 Put the rolled up tortillas in the casserole dish, add the enchilada sauce and top it of with the Mexican Cheese. Cook in a 350F oven for 45 min. 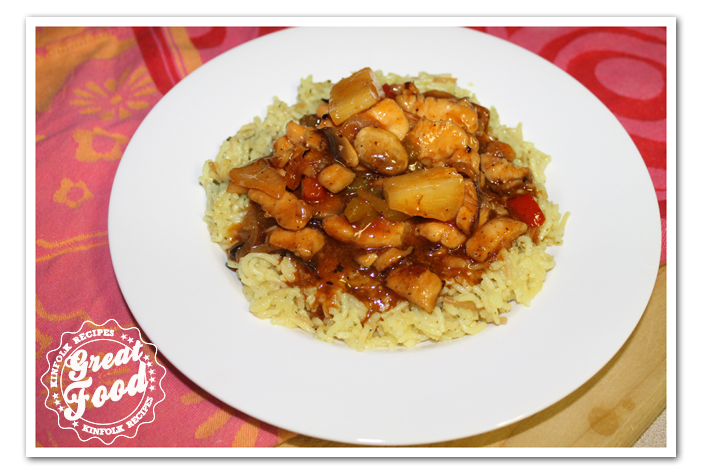 Put the chicken breast in a pot and add a knorr bouillon cube. 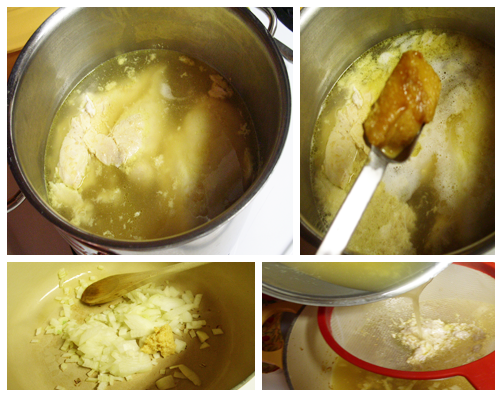 Boil the chicken breast, till done (about 20 min to an ½ hour on medium high). 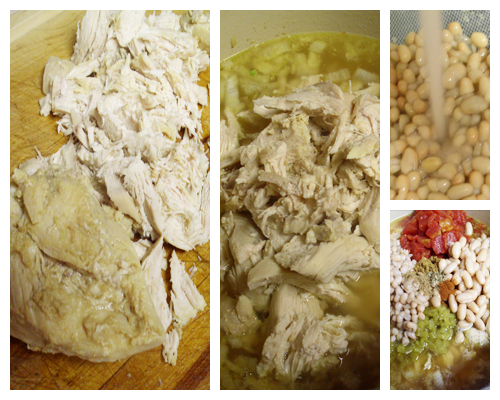 Do not throw the chicken broth away, you need it for the enchilada sauce. Shred the chicken, add 1 cup of sour cream, 1 can of chilies, 1 tbsp. chili powder, 1 tbsp cumin, ⅛ tsp. red pepper, ½ can of re-fried beans. Stir it up. Add 1 cup of Mexican Cheese. Put 1 heaping tbsp of meat mix on the tortilla and roll it up. Put some enchilada sauce in the bottom of the casserole dish. 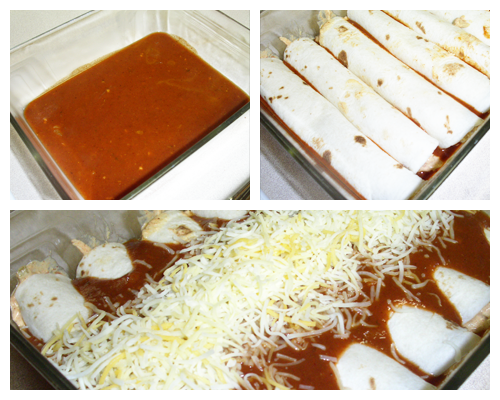 Put the rolled up tortillas in the casserole dish, add the enchilada sauce and top it of with the Mexican Cheese. Cook in a 350F oven for 45 min.